Last edited by kch50428; 12-18-2012 at 12:51 PM. Some are reporting trouble downloading it from the device...hang in there guys! Which one should i get, iPhone5,1 or iPhone5,2? Well are u on gsm or CDMA network? Well just updated today, let's see how it goes with my wi-fi issues. After updating I'm getting serious fluctuation on my 5Ghz. network (as far as signal to the iPhone goes)...my Macbook Pro, iPad (6.0.1) and other devices in the house have a solid "full strength" reading on this network, but the iPhone is switching between low-medium connection. Connection speeds seem to be the same across the board, including iPhone, and speeds downloading on the phone itself are fine over the network...the WiFi signal indicator just keeps fluctuating. let's see how it goes with my wi-fi issues. Funny this is still happening for some when this was supposed to be fixed in the update before this one. Maybe it is a design flaw somehow in the i5? My wifi speeds were great and had no problems before the update today. My 40+Mbps is now 1.5+/-Mbps. U seems to have a issue either with your connection or the router. Wow that's really bad. Something is wrong there. Well I have called Brighthouse and the reset everything on their end and it didn't fix anything. I called sprint and did a network reset and the ##873283# and that didn't resolve the problem either. I just got my iPhone 5 Saturday and was on 6.0.1 and had zero wifi problems until the 6.0.2 update today. 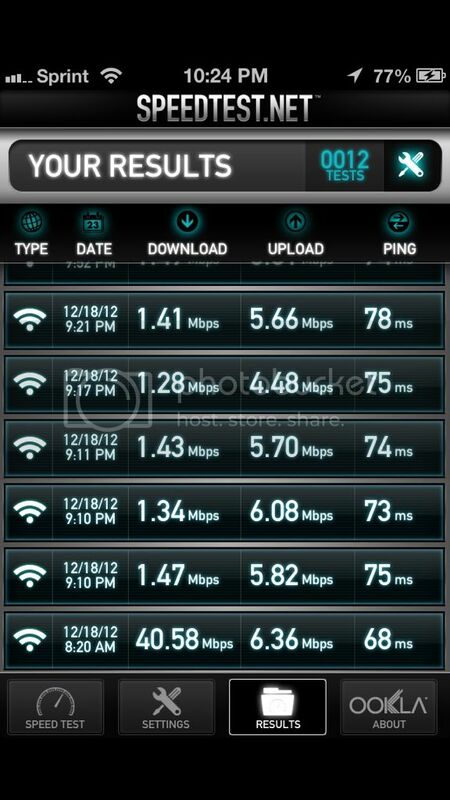 This is my wifi speeds before the update on the bottom and after the update above it. Have you tried 'Reset Network Settings' ? Yes. I posted that I did. Have you checked what server you are pulling from? Your the man!!! I tried 5 different servers and 2 were slow and 3 were lightning fast. I think i should restore it via itunes...will i loose all my app data like saved games and scores if i restore it?? If you restore from back up then you won't. New RTS Land Air Sea Warfare Released! iPhone Game Giveaway!!! Apple Drops [Redacted] NDA for Released iPhone Firmware!